This European-World History outline is appropriate for both AP and general education classes. It covers the rise of Napoleon from his birth in Corsica to his ultimate defeat at Waterloo, as well as his legacy in Europe and around the world. Scroll down to print (PDF file). 1. Studied the pyramids, etc. i. British attacks on American ships still trading with France helped spark the War of 1812 with the U.S.
a. What were the results of France’s Egyptian Campaign? b. How did Napoleon come to power in France? d. Why did nationalism spread throughout Europe during the Napoleonic era? e. Who was Nelson and what role did he play in the eventual defeat of Napoleon? a. What political and social reforms did Napoleon make in the lands he conquered? b. Describe the events of the Peninsular War. c. Describe the map of Europe in 1812.
d. What events brought about Napoleon’s abdication? e. At what battle was Napoleon finally defeated? f. Was Napoleon a good leader? Why or why not? Look at this question from the perspective of a French peasant, French émigré, Spanish peasant, and Spanish noble. 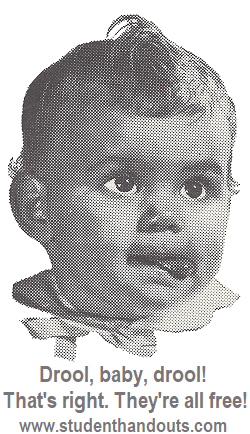 Click here to print (PDF). For a powerpoint version of this outline, click here. 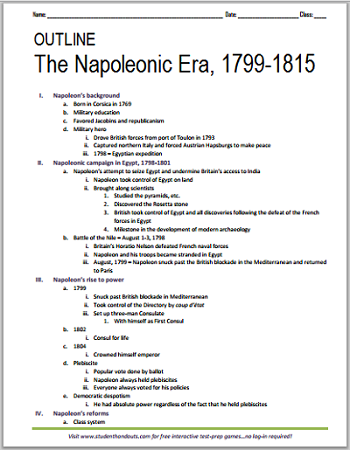 Click here to go to our main page for free educational materials on the Napoleonic Era.